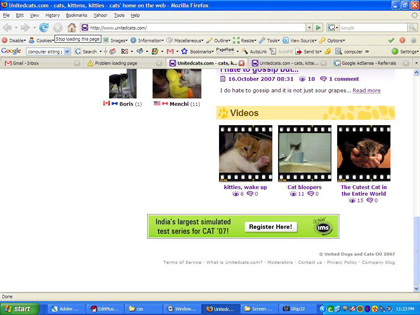 I have visited UnitedCats website from Mashable blog. This is a website for cat lovers. On the home page, when I scrolled down I just laughed when I have seen an ad about CAT exam, which is an MBA entrance exam conducted in India. I just thought of sharing it here for some fun. This entry was posted in: FunBookmark the permalink. Post a comment or leave a trackback: Trackback URL.